I have purchased 2016 Accord EXL recently. I am having issue transferring Hangout calls from IPhone 6 Plus to Car. 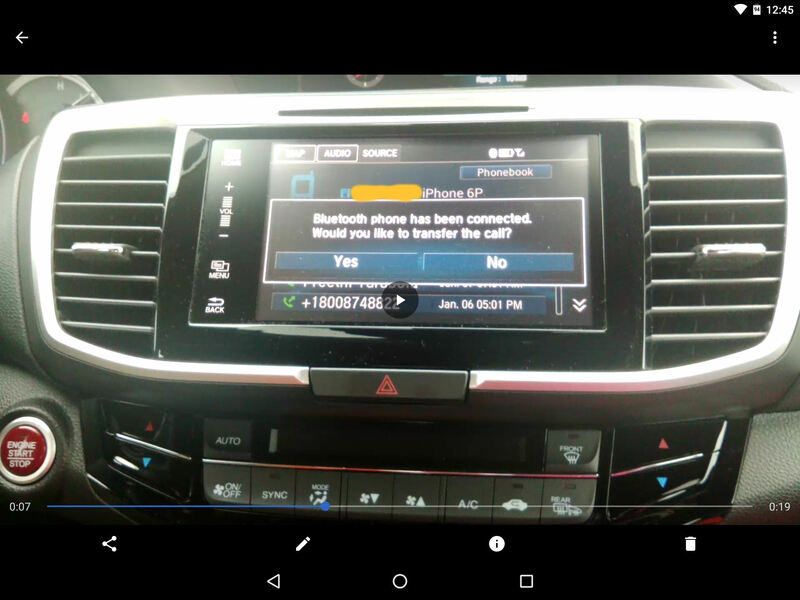 After placing call from Hangout and try to transfer call to Car, system prompting a message "Bluetooth phone has been connected. Would you like to transfer the call?" with Yes/No option, but message disappearing quickly before making the choice (I have to recorded the video to see the message). I went to dealer and tried the same on the 2016 Accord LX and noticed the there is an option in phone setting to Auto Transfer option selected to Yes. When I turned that off it is behaving similar to EXL model. I have compared the Owners Manual for LX (Page 312) and EXL (Page 336) under Phone Settings, Auto Transfer option is not available in EXL model. I will appreciate if you any one have any thoughts on setting the Auto Transfer option to Yes in EXL. the touch screen is made by Alpine and the non-touch screen is made by Pioneer. They are totally different radios which is why you will see differences between them. if you are in the middle of a call when you enter/start the car will it transfer? is the issue only when the car is already on and you start a call from the phone in Hangout? will it transfer if you start a call normally? There is no difference in behavior, whether I start car during the call or initiate the call while car already running. For regular phone calls system prompts with Yes/No and I can choose and transfer the call. But for Hangouts it is prompting but not letting me to choose the option Yes. Exact behavior I have noticed when I turn off the Automatic transfer on LX model also. sounds like an application conflict for which you won't find a fix unless they update the app and improve compatibility.